August 1991. The Metal God pops the clutch on his massive Harley and rolls forward into the fog shrouded darkness. Gliding the beast forward with only the roar of the crowd to guide him, he is unaware that a hydraulic stairway has only partially descended, and smashes into it face first, breaking the bridge of his nose and tumbling off the bike beneath the gigantic stage set. He lies unconscious and bleeding for three minutes before he is found. 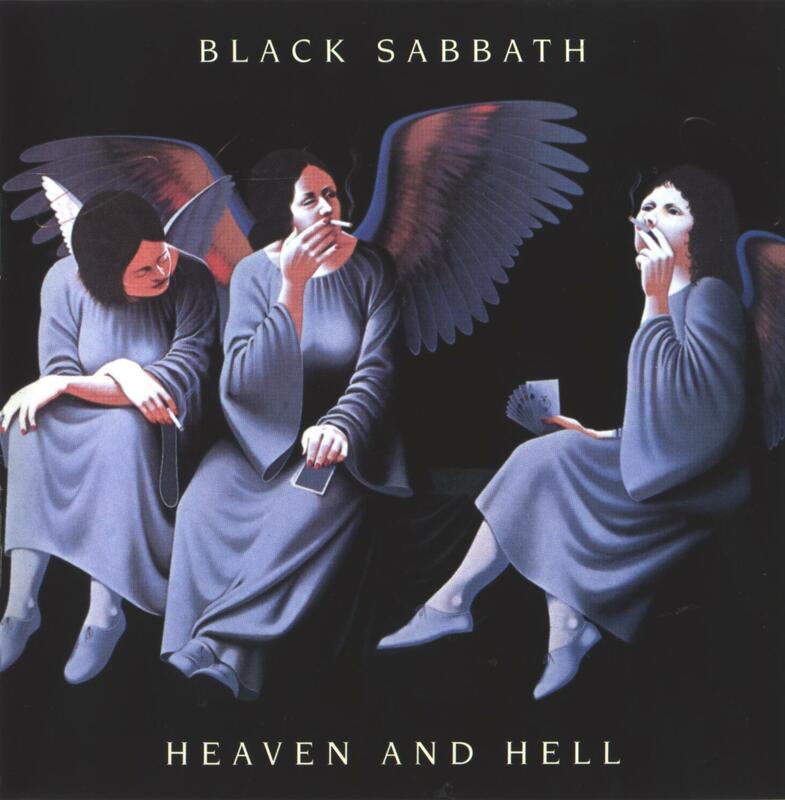 ‘Hell Bent for Leather’ is performed for the first and only time without lead vocals. It was the dawn of the 1990s, and a difficult time for Heavy Metal; especially for Metal bands from the ’70s and ’80s trying to stay relevant. Judas Priest had never been afraid to ‘adjust’ their sound to better suit the ever-changing Metal landscape; ‘Turbo’ and ‘Painkiller’ were both concessions to prevailing trends (hair metal and thrash metal, respectively). Both records were successful, but it had been difficult for many to watch Priest, one of Heavy Metal’s most important pioneers, chasing trends rather than setting them. And now the ’90s were presenting new challenges: Metallica had abdicated their throne, and Grunge, Alternative Metal, and Nu Metal were all about to make life difficult for several iconic bands from HM’s glory days. For Rob Halford, the writing was on the wall. Meanwhile, Iron Maiden were weathering the early 1990s fairly well. 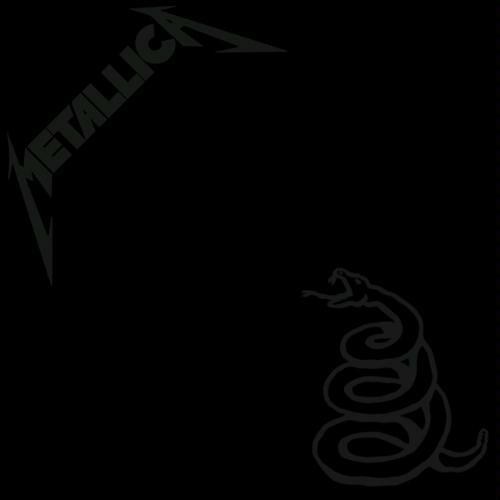 Their stripped-down response to the Big Four, ‘No Prayer for the Dying’, hit #2 in the UK, and the album’s (awful) single ‘Bring Your Daughter… to the Slaughter’ hit #1. The follow-up album, 1992’s ‘Fear of the Dark’ also hit #1. But singer Bruce Dickinson was bored, bored, bored. A solo album and tour in 1990 hadn’t been enough to calm the singer’s restless spirit, and while working on a second solo record during the ‘Fear’ tour, Bruce decided to leave the band. The final legs of the ‘Fear’ jaunt became Bruce’s ‘farewell tour’, which wrapped with a televised performance in August of ’93. The show was broadcast live as a pay-per-view event; magician Simon Drake performed magic and illusions during breaks in Maiden’s set. Drake’s final trick: making Bruce Dickinson disappear. The Metal God and The Air Raid Siren were gone. Halford and Dickinson’s departures left gaping holes in each of their former bands. Square in the middle of the metal-unfriendly ’90s, both bands would have to establish themselves all over again in an inhospitable landscape ruled by Soundgardens, Nirvanas and Faith No Mores; to prove themselves to a brand new generation of Metalheads raised on the Big Four, Pantera and the emerging Death Metal genre. But there was so much more at stake here than just the fate of two legendary Heavy Metal bands; the fate of Heavy Metal itself hung in the balance. Would Metal survive the ’90s without Judas Priest and Iron Maiden? Twilight of the Gods, indeed. For a while, it appeared as if Judas Priest were honoring Halford’s request for ‘three to four years’ off. Not much was heard from the JP camp until 1996, when their new lead vocalist was announced: Ohio native Tim Owens. Dubbed ‘Ripper’ by guitarists K.K. 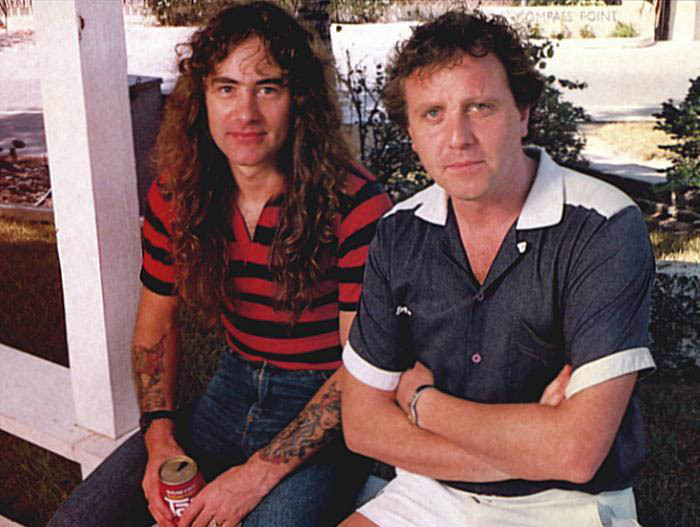 Downing and Glenn Tipton, Owens was a virtual unknown who fronted two small-time bands: Winter’s Bane and British Steel. While the former was an all-original metal band, the latter was a JP tribute. The two bands were usually booked together, with Owens fronting both. When a videotape of a British Steel performance somehow made its way to Priest, Owens shot ahead of shortlisted candidates like Ralph Scheepers (Gamma Ray) and Sebastian Bach. Four days later, Owens was in the UK auditioning for the band; after singing one song, ‘Victim of Changes’, Tipton offered him the gig. Steve Harris wasted no time reaching out to Blaze Bayley of Wolfsbane, who had supported Maiden on the NPftD tour just a few years earlier. Bayley politely declined. Woflsbane had done three albums, an E.P. and a few singles, and were ready to re-enter the studio for album #4; both parties chalked it up to bad timing, and Harris moved on. ‘Arry and the rest of Maiden then slogged through thousands of tapes, CDs and videos sent in by hopefuls from all over the globe… and got nowhere. But by the time Bayley was to enter the studio to begin his band’s fourth album, he had changed his mind, deciding that Wolfsbane had run its course. Bayley soon found himself facing off against Doogie White (just a few years away from joining Rainbow) for the Maiden job. Bayley won. Priest had perhaps found the one man up to the task of recreating Rob Halford’s histrionic vocal stylings. But in losing Halford, JP lost a lot more than a voice; they lost an attitude, a swagger, and a particular lyrical voice. Halford’s acting background was apparent in his delivery; he could (and regularly did) deliver ludicrous lyrics in a convincing manner, with an air of melodrama and just the right amount of camp. Tim Owens had the pipes but none of Rob Halford’s charisma. Blaze Bayley (real name: Bayley Cook) was blessed with a deep, resonant voice capable of conveying a strong sense of the dramatic. However, Bayley often sang one full octave below his predecessor, delivering Harris’ overstuffed lyrics with an oppressive air of doom and gloom. After 12 years of Bruce Dickinson, an almost super-human vocalist with a flair for the dramatic, even operatic, it’s hard to understand exactly why Steve Harris felt that Blaze Bayley’s voice was the right fit for Maiden. 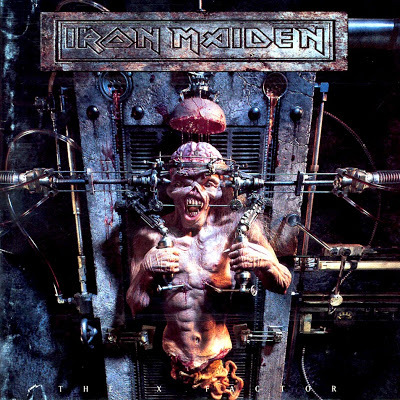 Iron Maiden’s tenth album, ‘The X-Factor’, hit in 1995, just two years after Bruce ‘disappeared’. It’s a difficult album. The opening song, ‘Sign of the Cross’, clocks in at over 11 minutes, and quickly sets the tone for the next 70. Every song begins with a quiet, delicately-played intro, and then plods along for far too long. The ghost of Steve Harris’ marriage hovers over this album, in both the dour, overwrought lyrics and in the music’s downbeat vibe (the album’s lone ‘fast number’ was written by Bayley/Gers). Bayley’s heavy, brooding presence prevents even the more energetic moments from ever fully taking flight; the man can sing but brings none of the spirit and spark that characterized Dickinson’s better performances. It should also be pointed out that longtime producer Martin Birch was not on board for this album… And the cover is hideous. Priest’s first post-Halford album is truly awful. 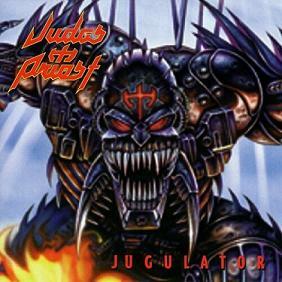 1997’s ‘Jugulator’ is a train-wreck of harsh, over-processed guitars, anguished vocals, terrible lyrics, and haphazard production. Tipton and Downing wrote all of the music, and several concessions to current trends are immediately evident: down-tuned guitars, atonal guitar solos, and Death Metal-worthy titles like ‘Dead Meat’, ‘Decapitate’, Blood Stained’ and ‘Death Row’. Ugh. Tipton himself wrote all of the album’s relentlessly negative lyrics. Each song begins with a short, atmospheric intro tacked on, with creepy guitars, dialogue or sound effects, adding nothing to the proceedings. The guitars are heavy as hell, but without the wit and irony that Halford’s presence always unfailingly provided, it’s a grim, abrasive hour of music. After the much-maligned ‘The X Factor’, Iron Maiden included a new track, entitled ‘Virus’, on the 1996 compilation ‘Best of the Beast’. 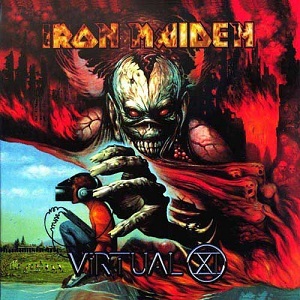 Dodgy sound notwithstanding, this energetic and interesting song established that Maiden had indeed awakened from their coma, and the album that followed, 1998’s ‘Virtual XI’, impressed with a lighter tone and brighter sound than its predecessor. As for the songwriting, however, chief writer Steve Harris had clearly lapsed into formula, and each song on VXI sounds remarkably like the song before it. While VXI does contain the Blaze era’s lone classic: ‘The Clansman’, the album’s first single, ‘The Angel and the Gambler’, repeats it’s chorus so many times, you’ll feel the need to check your turntable to make sure your needle isn’t stuck… even if you’re listening via mp3. The single clocks in at 6:05, edited down from the 9:56 album version. Martin Birch, where are you? 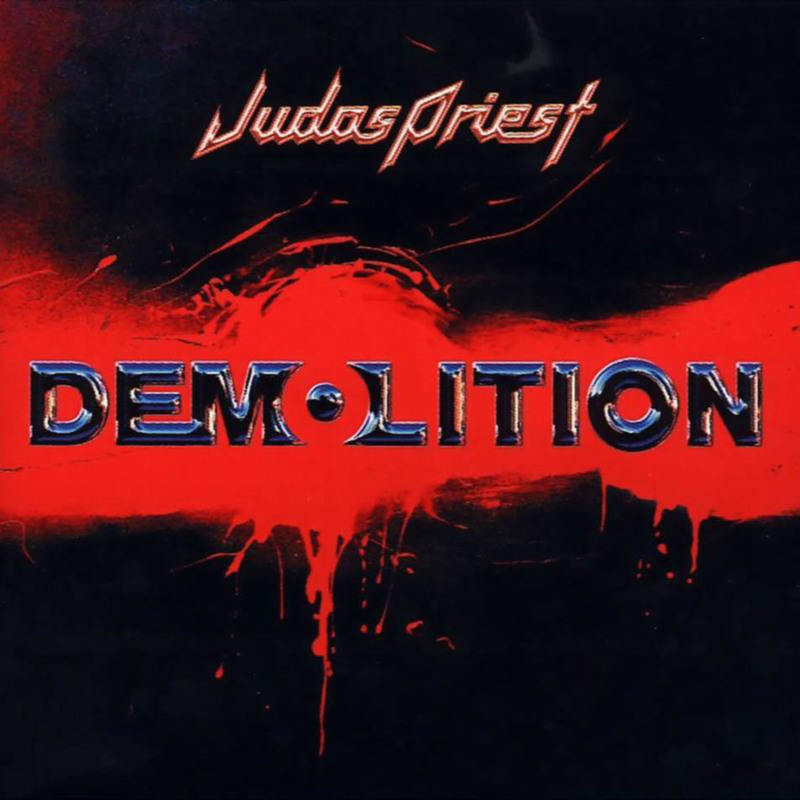 Priest’s second stab at establishing a post-Halford credibility was 2001’s ‘Demolition’. Again, it’s Tipton’s record, and again he demonstrates his inability to grasp just what made Priest so special. This record is a little more well-rounded than ‘Jugulator’, but also suffers from trying to be all things to all people; Nu Metal, Rap, and Industrial Metal, as well as elements of ’80s Priest all feature here, and absolutely none of it works. There is, however, a melody or two to be found here, unlike the band’s previous disaster. Imagine Judas Priest at their absolute heaviest, then imagine them pushing even harder, but without the irony; without the campy panache or the flair for the melodramatic that informed their best work. For Heavy Metal, the Bayley/Owens era was a near-death experience. When viewed against Priest and Maiden’s previous body of work, all four of these records were colossal artistic and commercial failures, and in the battle for the survival of Heavy Metal, they did more damage than good. Without these two massive flagship franchises to help hold Metal’s fan base together, the genre continued to splinter and fragment into fractious sub-genres. Heavy Metal survived the ’90s by blowing itself to bits and continuing forward as an amalgam of separate and distinct pieces of a disparately unified whole. As solo artists, Halford and Dickinson released some decidedly un-Metal music, but each eventually returned to classic Heavy Metal with records that beat their old bands at their own game, and positioned both vocalists for their eventual (and inevitable) return. A revitalized Priest & Maiden helped establish yet another (and perhaps the most important) HM sub-genre: Legacy Metal. Cheers to Blaze Bayley and Tim Owens for ushering two of our favorite bands through Metal’s darkest days. Coulda been worse… Sebastian Bach?? Doogie White?? Peter Green was losing his mind. Excessive LSD use was starting to take its toll. By late 1968, his bandmates in the band he had founded, Fleetwood Mac, had become concerned about Green’s mental state. He was growing distant, was sometimes incoherent, and had begun wearing robes and a crucifix. By 1969, Fleetwood Mac’s founder and main songwriter had provided the band with a No. 1 hit single (‘Albatross’), as well as two No. 2 singles (‘Oh Well’ and ‘Man of the World’). But in the wake of those successes, the guitarist was becoming estranged from the rest of his band, and was increasingly fixated on the morality of the band’s recent financial success. A 3-day LSD binge at a commune in Munich in early 1970 greatly exacerbated Green’s mental descent into schizophrenia. Around this time, Green wrote a song called ‘The Green Manalishi (With the Two Prong Crown)’ after waking from an acid-induced nightmare in which a green dog that Green ‘understood’ represented both money and the Devil, barked at him. In the dream, the dog was dead, as was Green himself; eventually Green won the struggle to return to his living body in order to wake from the nightmare (hey, this is acid, folks). Green awoke from the dream and immediately wrote Fleetwood Mac’s next hit single. The song would reach No. 10 in the UK. Before the song became Fleetwood Mac’s fourth consecutive Top Ten single, Peter Green quit the band he had founded. Mick Fleetwood remembers Green demanding that the band give away all their money; specifically, that they use their money to help end world hunger. Green also insisted that he be the one to give the aid to the poor and hungry, in order to avoid charitable organizations, which he did not trust. After the rest of the band refused, Peter Green left the band. 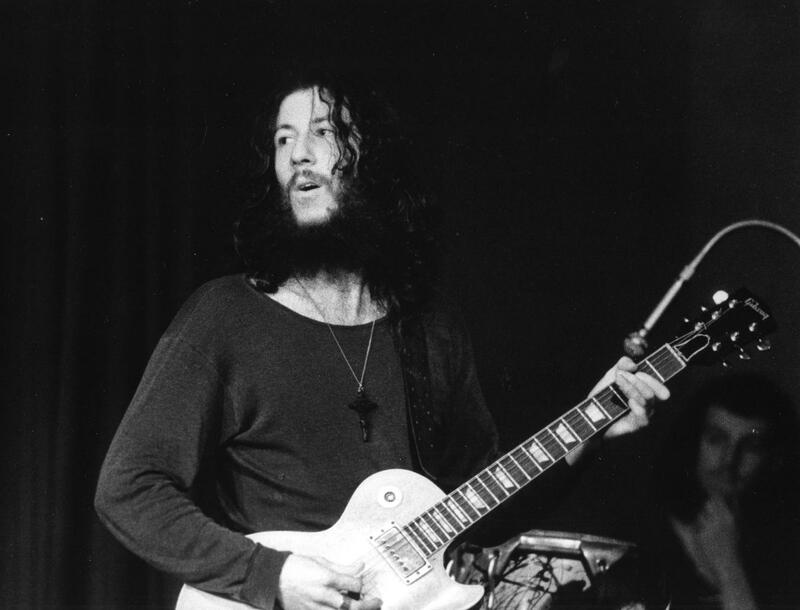 Peter Green was an integral part of the ‘British Blues Boom’ on the mid-to-late ’60’s. He replaced Eric Clapton in John Mayall’s Blues Breakers, and formed Fleetwood Mac in 1967. Metal historians agree that these bands (along with fellow Brits the Yardbirds) laid the groundwork for the evolution of Heavy Metal music. Follow that evolutionary path into the mid-70’s, and you’ll eventually encounter The Beast that is Priest. Heavy Metal had come a long way in a short time, quickly morphing from ‘white boy blues’ into a valid genre unto itself in just a few years. Birmingham’s Judas Priest were pivotal in metal’s evolution; their 2nd album, 1976’s ‘Sad Wings of Destiny’, is a landmark in the development of the form in that it steps away from the genre’s blues roots and into a sound and style unique unto itself. Someone at CBS Records recognized the genius at work on ‘SWOD’, and signed Judas Priest to a multi-album deal. Priest’s third album, ‘Sin After Sin’, was another groundbreaking heavy metal record, but their new label was interested in commerce at least as much as they were in art. CBS insisted that the band record a cover song to attempt to garner some airplay. Producer Roger Glover suggested Joan Baez’s haunting ‘Diamonds and Rust’, and the rest is history. For album number four, 1978’s ‘Stained Class’, the label once again insisted on a track to push to radio; ‘Better By You, Better Than Me’, written by Gary (‘Dream Weaver’) Wright and originally recorded by Spooky Tooth, was recorded at the 12th hour with a different producer, and tacked onto the already-completed record. Did including these cover versions deliver the results that CBS was looking for? No. Neither of these covers were ‘hits’; neither charted at all, anywhere. But the execs at CBS took no chances with the band’s fifth album, entitled ‘Killing Machine’. Released a scant 10 months after ‘Stained Class’, ‘Machine’ revealed some major concessions by the band in the songwriting department, but CBS was still unhappy with the album as a whole, at least in terms of its ‘commercial potential’ in the US. The label, uneasy with the original’s ‘murderous implications, changed the title of the record for the US market to ‘Hell Bent for Leather’. CBS also pushed for yet another cover. 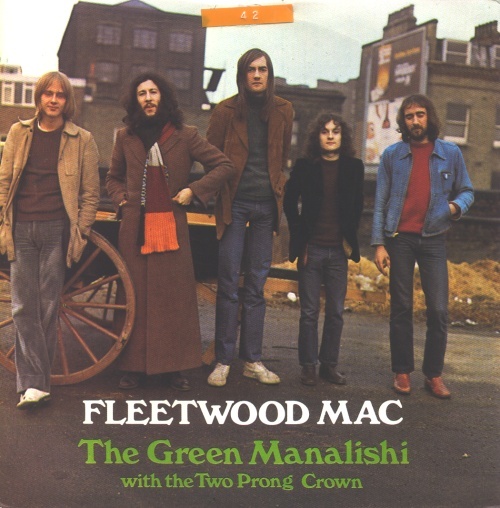 The Gun’s ‘Race With the Devil’ was demo’d, but was dropped in favor of Fleetwood Mac’s ‘The Green Manalishi (With the Two Prong Crown)’. 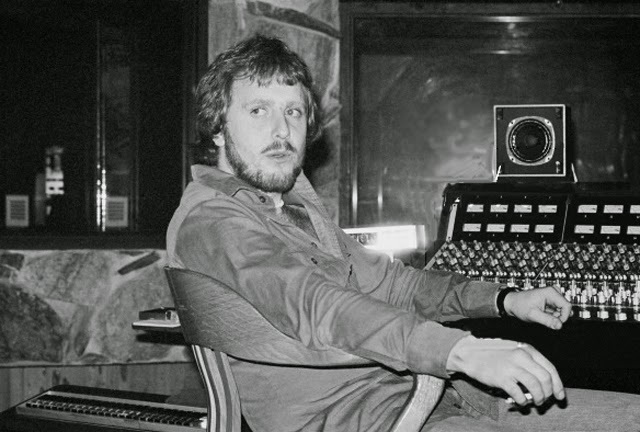 Judas Priest transformed Peter Green’s haunting, acid-induced warning of the evils of wealth into a crushing juggernaut of menace and melody. The song is gathered up and rewritten into a cast-iron structure and rolls along like a Sherman tank. Green’s mysterious ‘Manalishi’ character turns from the psychadelic money is the Devil in a dead barking dog into another one of Priest’s fantasy/sci-fi hero/prophet/savior/doomsayer figures, the latest in a long line of exciters, dreamer/deceivers, sinners, rippers, aggressors and starbreakers. CBS tacked ‘Manalishi’ on to the US version of the re-titled ‘Hell Bent’… but did not release it to radio. Priest had given the suits what they wanted, but had actually written better singles themselves this time around. ‘Take on the World’ was released instead, and reached No. 14 in the UK. 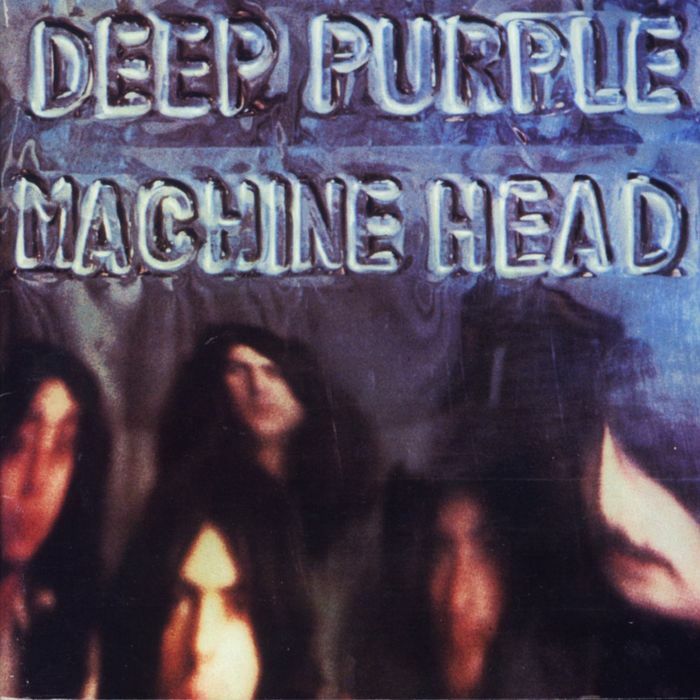 Priest/CBS would abandon the cover idea after ‘Manalishi’; the strategy had ultimately failed to increase the profile of the band, let alone the balance of anyone’s bank account. 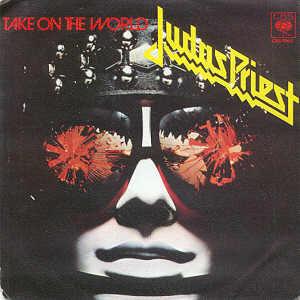 Judas Priest would have Top Forty success with the UK version of the album that excluded ‘Manalishi’; the US version that did include the song would peak at a lowly No. 167 in the States. In recording ‘The Green Manalishi (With the Two Prong Crown)’, Judas Priest had messed with some bad mojo; Peter Green’s Manalishi was still barking.